You're sent by your master to investigate some strange goings-on, and you'll gradually unveil events that menace the very peaceful existence of your world. Your journeys will take you across many regions of a fantastic world, and beneath its seabed, riding an ancient spaceship to an alien pyramid, to the Underworld where you must convince the gods themselves to aid you willingly or by force, and finally to the sky where you must face the ultimate battle. Rock'n roll! This is a very engaging game with a very nice mix of genres. It's actually made up of two modes of play, both of which would be nothing so special on their own, but together make a great combination: adventure and action. 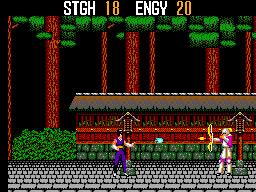 The story advances in a kind of graphic adventure interface with limited options, and some manga pixel art that greatly adds to the quality. Be warned that there are puzzles and you're likely to get stuck in some of them at some times. The story is actually not very original (save the Universe), but then again most RPGs have unoriginal plots--if they can be called plots at all. On the other hand it's very well developed, one of the game's strong points is the world it's set in. Frankly, the fantasy found in this game is very hard to find outside Japan. Anyway keep in mind that this game, and the manga it's (loosely) based upon, are from the 80s, so it graphically resembles for example Knights of the Zodiac (Saint Seiya) more than present manga. The enemies you'll fight are mostly diverse forms of evil spirits, actually very diverse, I mean there are dozens of different ones throughout the worlds you travel--which is good. But of course no classic action title would be complete without the spice added by bosses, and of course every once in a while you must defeat a boss to progress, be it an enemy warrior with powers no less amazing than your own or a nightmarish apparition of whatever sort. Some of them are tricky, but most aren't difficult; actually I miss some more serious challenge in this area. My opinion is that the graphics are pretty darn good, on several levels. The sprites usually make most of the SMS's screen resolution, depicting many different enemies, and some of the bosses are superb (whereas some others aren't). 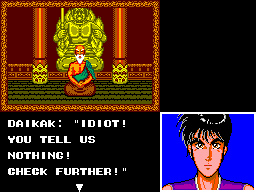 The backgrounds are rich and together with the enemies really succeed at getting us into the fantastic world of demons and mystic warriors. And that's less than half of the story, because the best part of this game's graphics is displayed during the adventure parts. Also then the picture of the hero in the lower right corner shows whether he's in fighting stance, his mouth moves when he talks, and he actually winks from time to time. This game really shows the love its makers put into it. In the Japanese version (called Kujaku-Oh like the manga) the hero is wearing long monk's robes, whereas in the export version this was changed to plain shirt and pants. The sounds are okay for the 8 bits era--God bless emulation for that FM sound chip. There are different tunes for different situations, both in the action and adventure modes. I would say the tunes are fairly inspired and contribute to the experience. The basics are quite simple, shoot and jump. I myself find the hero runs kind of slow--specially since he can apparently jump almost two metres high--, and that's too bad specially for fighting bosses. You can't charge the fireball and run at the same time--which makes sense on the other hand. To select a prayer press the pause button, then hold fire and press down to use it. Hitting a moving target with Fudo can be tricky, but that's where skill is important. The prayers are an awesome element of the game, too bad that they aren't to be used more often. This isn't of course one of those arcade games that you'll use to kill time every other day. On the other hand if you liked as much as I and many others did, you'll always want to get back to beating it ever again sooner or later. So I'd say that even if it doesn't have a great short-term replay value, it sure has a long-term one--pretty much like Alex Kidd in Miracle World for example. (And if you're one of those wacky speedrunners then you've got plenty of work.) The game includes a password system, but if played in emulation the state-save feature is far more practical. I must admit this is a personal favourite, because of the rich gameplay and great atmosphere. 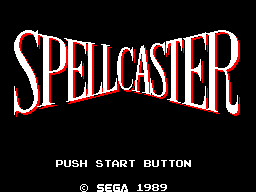 In my opinion the reason why it didn't become very famous is because of the limited circulation the Sega Master System enjoyed, otherwise it would likely have got up there into the RPG hall of fame. Still it's held very dear by many people who got to know it back at the time. There was a sequel after all, for the Mega Drive/Genesis, purely action platformer (boo).